Criteria for exclusion of patients from surgery for pancreatic cancer (ductal adenocarcinoma of the pancreas) include detection of distal metastases including those noted in the liver (also known as the hepatic organ). However especially over the past decade, there have been a number of studies aimed at trying to discern whether liver lesions alone should rule out pancreatic cancer surgery for every patient – or might careful selection based on chemotherapy response or multimodal therapy possibly including hepatic surgery treatment yield access to surgery and possible survival advantage? The outcomes of such studies have been mixed. For example, an article in the December 2007 issue of the journal Cancer by Johns Hopkins University researchers showed no advantage by including hepatic metastases in the greater scope of surgical targets in pancreatic cancer surgery, whereas in 2008 German authors presented a review of the medical literature in the journal Digestive Surgery which indicated that there might be such a survival advantage in select such patients with pancreatic cancer. But 2016 produced at least four studies (including the article-under-review; with a link at the end of this blog entry) from international researchers (including one Johns Hopkins researcher) which address the issue of concomitant surgery of hepatic metastatic lesions along with more standard pancreatic cancer in select patients, or standard pancreatic cancer surgery under select circumstances (significant response to chemotherapy). The article under review was authored by researchers from Vita-Salute University in Milan, Italy and from Università Politecnica delle Marche in Ancona, Italy. They published their results in the October 2016 issue of the European Journal of Surgical Oncology, the official journal of the European Society of Surgical Oncology and the British Association of Surgical Oncology. The authors retrospectively examined the outcomes at their two institutions of pancreatic cancer patients who had who had undergone chemotherapy for hepatic metastases without evidence of extra-hepatic metastases, and who had acceptable personal performance status. 127 patients were identified (76 male and 51 female), had been treated with chemotherapy, and followed with regular CA 19-9 levels. After treatment, 19 of these patients demonstrated a complete or partial radiological response of their pancreatic cancer; each of these patients additionally showed major biochemical response defined as a significant reduction of CA 19-9 levels. On subsequent evaluation, seven patients were excluded from pancreatic cancer surgery due to further studies that located increased liver or peritoneal metastases, or in one case a significant rise of CA 19-9 levels after the chemotherapy had ended. Laparotomy was performed on twelve patients with a full pancreaticoduodenectomy completed on 11 patients (one was found to have peritoneal metastases at surgery). In this sub-group of eleven patients with advanced pancreatic cancer who later underwent surgical resection, the median survival duration was 46 months as compared to 11 months for the patients with pancreatic cancer who were unable to undergo surgery (P< 0.0001). This is a quite interesting study that begins to challenge existing orthodoxy in the context of the effectiveness of new chemotherapy regimens for the treatment of pancreatic cancer. The recent research concerning possible advantages of hepatic surgery or multimodal treatment for pancreatic cancer with hepatic metastases in select patients will be left for another time. But for now, perhaps it is enough to highlight this tentative conclusion that identifies significant-response-to-chemotherapy as a marker to possibly negate the absolute exclusion of pancreatic cancer patients with hepatic metastases for surgical resection. Obviously more research is needed, but this is an intriguing outcome worthy of further consideration, with accolades given from this vantage to the authors. Posted in Medical Research, Pancreatic Cancer, Pancreatic Cancer Medical Treatment, Pancreatic Cancer Surgical Treatment | Comments Off on Later Surgery for Advanced Pancreatic Cancer in Treatment Responders with Hepatic Lesions ? How many Patients with Pancreatic Cancer are Platinum Responders ? Here in the Pancreatica Blog we have reported previous studies documenting patients with pancreatic cancer (ductal adenocarcinoma of the pancreas) with specific genetic characteristics such BRCA1 and BRCA2 mutations who have demonstrated robust treatment responses to DNA crosslinking agent “chemotherapy” such as platinum salts, PARP [poly ADP-ribose polymerase enzyme] inhibitors, and others. By way of shorthand for the purposes of this blog entry, shall we call these pancreatic cancer patients Platinum Responders? Mounting evidence appears to suggest that the group of pancreatic cancer Platinum Responders may be LARGER than previously understood, as the BRCA genes and subsequent protein cascading proteins that they control appear to “intersect” with another protein cascade known as the Fanconi Anemia pathway that can be traced back to a number of genetic mutations including in such genes such as ATM, FANCC, FANCG, PALB2, and perhaps others also associated with increased pancreatic cancer incidence. 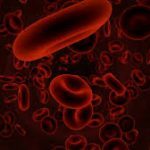 Of course, this is the cutting edge of medicine and science, and the results are coming from disparate medical studies, so we need to be careful in these assertions at the present time. But should more comprehensive study bear out these early results, the value in terms of possible duration of survival and treatment response for a subset of patients with pancreatic cancer, cannot be overstated. The key, should this prove true, is to distinguish those with pancreatic cancer who would benefit from genetic testing, identifying this subset of patients in order to match the right treatment to the right patients. Today’s paper under discussion by Holter et al. (link at the end of this blog entry, and included as an element in the chart immediately below), measures the occurrence of pancreatic cancer patients who carry inherited germline BRCA1 or BRCA2 mutations, and recommends guidelines for genetic testing in this circumstance. Unlike for breast or ovarian cancers, there are no USPSTF prevention guidelines for genetic testing of pancreatic cancer patients. A positive BRCA discovery may provide an opportunity for more effective treatment. Other patients that could possibly benefit in terms of the selection options for pancreatic cancer treatment may demonstrate acquired somatic BRCA1 or BRCA2 mutations (or those in select genes related to the Fanconi pathway) related to their tumors, but germline mutations were the focus of this particular study. The forest plot below summarizes a few recent papers which include trying to find the approximate percentage of patients with pancreatic cancer who also have inherited BRCA1 and BRCA2 mutations. The position of the rectangles shows the percentage of BRCA1 and BRAC2 patients in a study and the size of the rectangle corresponds to the number of participants. The horizontal lines extending outward represent the level of uncertainty in the measurement. Smaller studies have more uncertainty and longer lines. The last row combines the measurements from all of these listed pancreatic cancer studies into a single measurement. 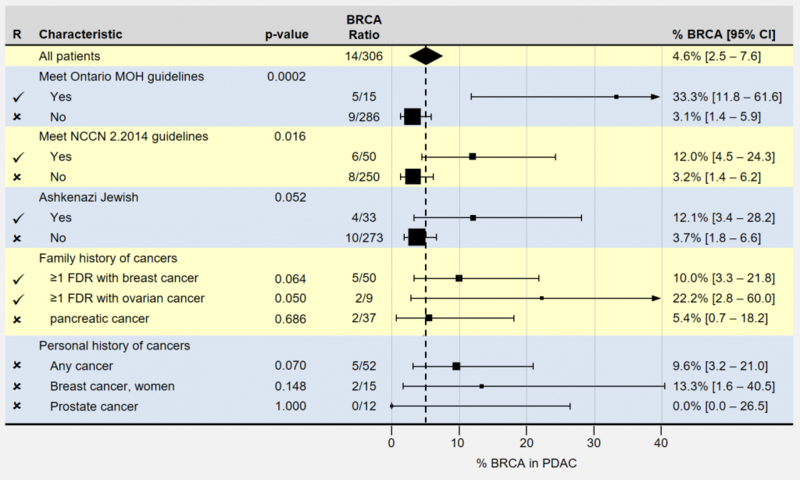 In these five papers the number of those with positive BRCA status is 41 out of a total number with pancreatic cancer of 951 yielding a percentage of 4.3%. You may have noticed the large differences in BRCA % occurrence in pancreatic cancer found within the papers above. Results can vary significantly between studies for many reasons, such as patient demographics contributing to selection bias. Study locations where BRCA mutations are more common in the population under study can result in much higher rates. For instance, 56% of the patients in the MSKCC study (Memorial Sloan Kettering Cancer Center is located in New York City) were of Ashkenazi-Jewish (A-J) ancestry, which tends to be higher than the general U.S. population and likely contributed to higher prevalence rates. The advantage of looking at the results of multiple studies is that it tends to smooth out the representation of the study populations. The authors of the study in question focused on identifying patients with inherited BRCA1 and BRCA 2 mutations in the context of pancreatic cancer. Their research examined each subject’s ancestry and family health history, finding certain characteristics associated with inheriting a BRCA mutation. As you can see, they identified 14 BRCA patients out of 306 with pancreatic cancer: 4.6%. The researchers are located in Toronto, Canada. The following forest plot summarizes the characteristics most strongly indicating inherited BRCA1 and BRCA 2 mutations in patients with pancreatic cancer. As before, smaller boxes and longer lines indicate less certainty in the actual prevalence rates. p-values smaller than 0.05 are often used to identify significant results, with smaller values being more significant. The authors recommend genetic screening for patients having characteristics indicated by checkmarks. Another way of looking at the results is by computing an odds ratio, presented below. Here, the odds ratio indicates how much MORE likely study participants with the characteristic were to have a BRCA mutation than a reference population. For example, Ashkenazi Jewish patients in this study were 3.6 times more likely to have a BRCA mutation than non-A-J patients. Significant findings usually have p-values less than 0.05. Longer horizontal lines extending from the box indicate more uncertainty in the result because of smaller sample sizes. In significant findings, you like to see that these lines do not cross 1.0, the ratio of equal likeliness. As one can plainly see, the odds of having a number of these conditions appear to be associated with an increased likelihood of carrying BRCA mutations. The study under question looked at the prevalence, clinical and familial characteristics of pancreatic cancer and recommends genetic screening for the following groups. The authors also suggest that because of the high mortality rate and opportunity for more tailored treatment, all patients with pancreatic cancer might be offered genetic counseling and testing at the time of diagnosis. Note that the three groups recommended above include any such patients that meet the Ontario’s Ministry of Health (MOH) or NCCN 2.2014 guidelines. A few of the patient characteristics didn’t quite reach the p<0.05 statistical significance, but were included anyway. Also of note is that patients with “any previous cancer” were not included despite their very similar ratios, confidence intervals, and p-values. Confusingly, barring an A-J ethnic background, the only groups to be offered genetic testing were identified by familial cancer history, despite their own finding that most BRCA1 and BRCA2 mutation carriers found did NOT have a qualifying family history of cancer. The authors noted drawbacks to offering genetic testing more widely in regard to pancreatic cancer were related to its low yield and high costs. In an accompanying editorial, these authors also address the family consequences of dealing with BRCA-associated cancers. While valid points, to this blogger, there appears to be no appropriate articulation regarding the potential of the serious up-side for certain patients with pancreatic cancer? For instance, finding a BRCA1 or BRAC2 mutation in a locally advanced or borderline resectable pancreatic cancer patient could dramatically boost their chances at receiving a potentially curative surgical resection. Currently, testing costs for inherited BRCA1 and BRCA2 mutations (as a panel which includes many other genes) can be as low as $250. The phase 3 clinical trial of the 4-drug FOLFIRINOX regimen (that includes the platinum-based drug, oxaliplatin) for advanced pancreatic cancer saw a 32% overall response rate (ORR), substantially higher than one may have expected (a 2009 phase 3 trial of gemcitabine/oxaliplatin had a 27% ORR). Given the results and considerations of this and other recent studies, this blogger is forced to consider, could some of these responses be due to an outsize effect of oxaliplatin on pancreatic cancer patients in the studied cohort with unidentified germline or somatic BRCA (or other) mutations? And further, would genetic testing of FOLFIRINOX responders with pancreatic cancer be clinically beneficial before a later change to a subsequent treatment that might not include a platinum or other DNA crosslinking agent? Prevalence studies like the one in question are finding inherited BRCA1 and BRAC2 mutation at 4-6% of patients with pancreatic cancer. If identified, these potential “Platinum Responders” might better respond to tailored therapy. The effect of discussions along lines as suggested by this paper, given the increasingly lower costs and availability of genetic testing, cause this blogger to wonder if such testing ought not be sought comprehensively for those with pancreatic cancer, testing BRCA genes but also for those select Fanconi Anemia genes whose mutations appear to be related to increased prevalence of pancreatic cancer. Though various sources one is left with an impression that in toto pancreatic cancer “Platinum Responders” may be up to two or three times the number of those with germline BRCA mutations. Time and further research will tell. And finally, the lack of universally agreed upon screening guidelines for pancreatic cancer from authoritative sources are noted to be a limitation for the provider community. Posted in Medical Research, Pancreatic Cancer, Pancreatic Cancer Medical Treatment, Pancreatic Cancer Screening Tests and Markers | Comments Off on How many Patients with Pancreatic Cancer are Platinum Responders ? The four-drug FOLFIRINOX regimen represents a standard-of-care initial treatment for pancreatic cancer (ductal adenocarcinoma of the pancreas) despite substantive side-effects. Along with the gemcitabine plus Abraxane combination therapy it appears to offer survival advantage in pancreatic cancer over gemcitabine given alone. And increasingly, FOLFIRINOX is offered as therapy for locally advanced and “borderline resectable” pancreatic cancer with some studies particularly in the past couple of years or so indicating respectable success at converting non-surgical patient status into candidates for surgery. Now comes a case study of a patient, by way of highlighting the increasing possibilities of FOLFIRINOX in the treatment of these stages of pancreatic cancer, who achieved a rather remarkable response from the regimen. These results were reported by researchers from the University of Ottawa in Canada who published their findings in the October 2016 peer-reviewed open access journal, BMC Cancer. They indicate that they treated a 61-year-old female at their institution who was staged as borderline resectable pancreatic cancer with 13 cycles of FOLFIRINOX. A follow-up CT scan demonstrated that the pancreatic cancer tumor was significantly reduced in sized compared to the original scan (the noted tumor had been more definitely characterized via EUS fine-needle biopsy and histology review as ductal adenocarcinoma of the pancreas). 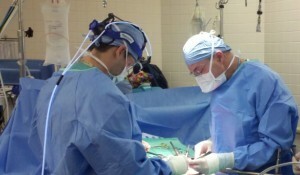 The patent underwent a Whipple procedure with the intent of potential cure. Pathology examination at the time of surgery demonstrated no evidence of disease in the excised tissue including none in the 23 lymph nodes taken. The researchers indicated that at 15 months post-surgery the patient appeared to have remained free of pancreatic cancer. The authors note that there has been a paucity of studies in the medical literature describing complete pathological remission in borderline resectable or locally advanced pancreatic cancer treated with the FOLFIRINOX regimen. And they suggest in reaction to the mounting evidence of likely favorable response that clinical trials might be in order to more rigorously explore the indications and outcomes of FOLFIRINOX treatment in these stages of pancreatic cancer. It seems difficult not to concur with this recommendation.